The Press Pilot 150 Series of clutch/brake controls allows your production to fly, knowing there is a reliable way to bring it back down to a safe stop. Dual processors provide the necessary redundancy and control reliability you need. This system controls basic clutch/brake functions on part revolution, mechanical stamping presses. 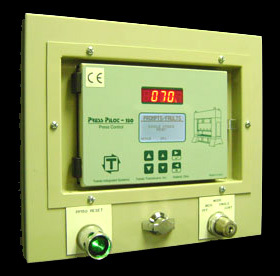 The Press Pilot 150 Series meets and exceeds ANSI B11.1, OSHA 1910.217 and CAN/CSA-Z142-02 standards. As with all Toledo Integrated Products, our Basic Press Control is engineered and manufactured in the United States in Holland, Ohio. Allows for resolver "slave mode"
Dimensions 8 " 10 " 5.5 "